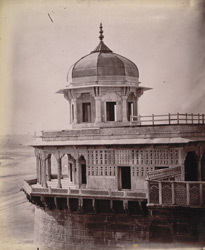 Photograph of the Mussaman Burj, Agra, from the Archaeological Survey of India Collections taken by W. Caney during the 1880s. The Agra fort complex stands on the banks of the Yamuna and was built by the Emperor Akbar between 1565 and 1573. Built principally as a military establishment on the site of an earlier walled complex, the fort is considered the predecessor of the Delhi Red Fort. The massive walls of the fort, built of red sandstone, are 20 feet high and 2.5km long with curved bastions at intervals. Emperor Shah Jahan (r.1628-58) was responsible for the Mughal buildings within the fort. Mussaman Burj also called the Samman Burj (Jasmine Tower) is a two-storey pavilion topped by an octagonal domed cupola, which stands on one of the largest circular bastions. It is richly decorated with marble reliefs, pierced screens and pietra dura. The top of the tower provides a panoramic view of the river with the Taj Mahal in the distance. This is where Shahjahan imprisoned by his son Aurangzeb spent the last years of his life. This is a view looking southwards along the fort wall towards the pavilion.